Between January and the beginning of November, I – along with several volunteers – were part of a remarkable oral history project about cinema-going in Worcestershire. The Lady (Luc Besson, 2011) 25 November, 2012 12 cert. Splendid Cinema presents the biopic of Burmese peace activist and Nobel prize winner, Aung San Suu Kyi, The Lady, on November 25th at 7:30pm at Worcester Arts Workshop. 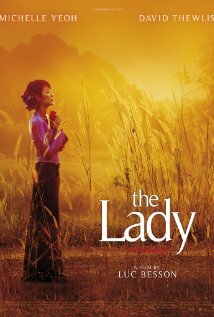 The Lady follows the Burmese born but London raised peace activist Aung San Suu Kyi in her peaceful opposition to the military junta in Burma/Myanmar, including her house arrest and the strain it puts on her family who both support her politics, but also worry about her safety. Winner of the 2012 International Human Rights Award, The Lady stars the incomparable Michelle Yeoh in a career defining performance. Known mostly as a martial artist in a number of excellent Hong Kong films opposite Jacky Chan and Jet Li, Yeoh gives a truly remarkable performance as Suu. Her performance alone is worth the effort to see this film. Also starring the great (and much underused) David Thewlis as Suu’s incredibly patient and supportive husband Michael Aris. There is not a bad performance in this film. The Lady is directed by Luc Besson, the French auteur of such Cinema du Pop classics as La Femme Nikita (1990), The Fifth Element (1997) and Leon (1994), and while the film is much less action-oriented than most of his other films, it is still a beautiful looking film. It also demonstrates a sincere and heart-felt desire to tell this incredible story of bravery. For possibly the first time ever, Besson restrains his over-the-top visual sensibility and lets the story tell itself. The Lady (UK & France, 2011, Luc Besson) 127 min. 12a Cert. Splendid Cinema presents the stunningly gorgeous animated film, Chico & Rita, on November 11th at 7:30pm at Worcester Arts Workshop. Chico & Rita tells the story of two aspiring musical stars in 1940’s Havana, Cuba pursuing their dreams as well as the affections of each other, from Havana to New York, Las Vegas and Paris. The couple have a turbulent love affair, with Rita finding fame and fortune in America and Chico chasing after her. They battle impossible odds to unite in music and love. Nominated for Best Animated Feature Film at the 84th Academy Awards (the first time that a Spanish full-length animated film was nominated), the film won the 2012 Goya Award (the Spanish equivalent of the Oscars) for best animated film. This stylish animation is a joy to watch and perfect for any hopeless romantics out there. 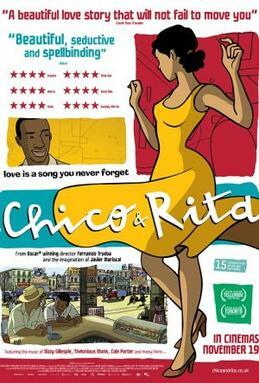 Chico &Rita (Cuba, 2011, Fernando Trueba and Javier Mariscal) 94 min. 15 Cert.